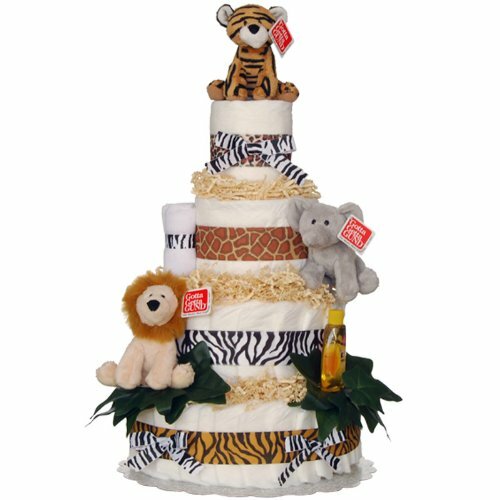 The Welcome to the Jungle Four Tier Diaper Cake by Lil' Baby Cakes features a Gund assortment of plush jungle animals. Included are a tiger, elephant, and lion. These adorable plush toys make animal sounds when you squeeze them. The design includes 70 Pampers Swaddler diapers wrapped animal themed ribbon. Safari stripped black and white bows and jungle leafs are included as an additional embellishment. Johnson and Johnson baby products including shampoo, wash, lotion, cornstarch based powder and two washcloths are provided for the care of the newborn. Each Lil' Baby Cake comes wrapped in white tulle and is ready for gift giving right out of the box. If you have any questions about this product by Lil' Baby Cakes, contact us by completing and submitting the form below. If you are looking for a specif part number, please include it with your message.